Lots of cutting tracks and rewiring required …. While not my doing, I saw one board come across my bench for initial testing and firmware installation that just wouldn’t connect to the debugger. Close inspection revealed that the fab had rotated the first QFP bootloader chip by 90 degrees. In the same run, I found another that was offset by one pin. That one took closer inspection before I realized why it wasn’t responding. My “favorite” mistake is SOT-23 vs SOT-323. The pictures on DigiKey look exactly the same. ???? But it doesn’t compare to an avionics DSP board protot where the big QFP sat belly up with hundreds of wires running out fo the pins. The pinout had been mistakenly reversed ! The dreaded “top view” / “bottom view” …..
Just flip the chip and bend the pins the other way, she’ll be right. Probably actually a decent way to obfuscate a chip’s identity too! This makes them sky pins? Why you do dis laff. @manu: I did consider calling them Sky Hooks… but I doubt many would get the reference. A length of string… to answer, “How long is a piece of string” with, “This long”. I have a feeling a lot more “tools” can be added, however all this has to fit in a suitcase for that first time in another job. I am missing the box of adjustable instant holes and the interdimensional screwdriver for unreachable corners. I have considered whether it’d be possible to hand-solder BGAs that way. Possible? Yes. Good idea? No. But the real question here is: did it boot? I would love/cringe to see the video. Oh look a Nvidia Based Chipset after the lawsuits from all the investors. Just found the context of that image. Instead of dead bug mounting would this be considered sea urchin mounting?!? Look at all that extra surface area for cooling! OK, Shall we the people coin this Wire Grid Array (WGA) soldering? @Unferium: If you look at my link (to the page where that image came from), you’ll see this has been done. The name is in the URL as you state. However MWGA for Missed (that one) Wire Grid Array. I mirrored the pins on an Altera FPGA, 200+ pin PGA package, five of them on the board. Solution? Mount them on the back of the board. I told people it was for extra cooling airflow. Humans learn from mistakes. So getting it wrong sometimes not a bad thing. However, letting the world know of your own roadblocks, fails, etc, can help others not fall down the same road and to help others with a quick fix suggestion when they do. OK, from now on I’ll resist non-constructive posts to a max of 2x per 50 comments and limit their comment to mild humor at best, unless the article is of low quality… Then I’ll either just not comment (Heck won’t even click on it) or this rule won’t apply. On a video capture chip in a package with 1 mm lead pitch, the manufacturer had numbered the 24 data outputs starting with 0 as the MSB, and I didn’t catch it, and connected them with 0 as the LSB. I wish I’d taken a picture of the rewiring job; it was pretty. Pretty ugly, that is. Then there is the classic one where there is a mismatch between the connector manufacturers pin numbering and the pin numbering of the footprint from the cad library. the use of corner to corner connection is actually a great failsafe method. Seen it a few times in commercial products, also makes seemingly compatible parts actually compatible where the pins are in the same place, however the internal construction rotates the conductors. I had this problem with through hole push buttons. After that I realized that I can change the footprint to be square (pins can be a bit bent) and never worry about it ever again. At least the prototype worked good enough to do the software installation (Linux OS) and setup. It’s gotten me once or twice early on so I know to triple check the datasheet against the footprint before committing. To92 can be worked with (while jamming to KoRn twisted transistor) but sot23 and to220 are a pain to try and correct when the wrong Pinot was chosen. Some people learn, some don’t. I know a few that, after 20 years will still make those mistakes and still argue with me on why it’s right while the triac is still smoking on the bench….. I hate it when I choose the wrong Pinot to accompany transistor soldering. That is almost as hard as picking the right Cabernet for a particular cheese. Check the datasheet? With through hole transistors? Maybe it’s because I buy too many old silent keys’ junk boxes and cheap ebay parts but I find that there are too many variations and I might not have the right datasheet. I prefer to have parts in hand and just slap them in a transistor checker. That way I KNOW which pin is which! I placed a 28pin TQFN footprint incorrectly, just once. But its one of my most proudest deadbug wiring fixes. Here’s the fix it log, last photo says it all. > Aaaargh, my fault, worked on that part too late at night. I have a rule which already saved two of my latest projects: Never send pcb to fab house the same day it’s finished. Do a thorough validation check next day. In every instance the next day I’ve found some errors which would be hard to fix. I agree. I wait almost an day now. I’ve done the switch one before. Worst fail, flipping a 50 pin 0.3mm pitch FPC connector. A great tech we had took some magnet wire and flipped it back in a couple of hours. My other favorite one – Siemens used to make a DMA controller chip in PLCC where they numbered pin one from the corner, when everyone else in the universe put pin 1 in the center of a side for that package. 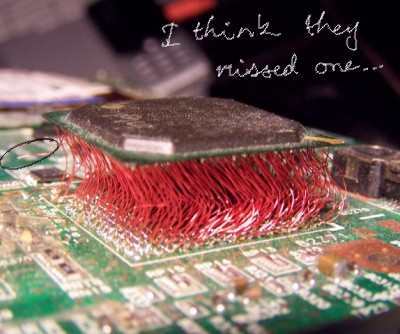 IIRC it was 84 pins and a messy rework. If you wanted a male 9 pin D connector and selected a female one, only to notice when you get the board back, you can put the male pin on the bottom of the board and the pinout will be fine. A while ago, I wasted about $100 worth of components on a stupid mistake: I had set the mask clearance of my PCB design to a certain value in inches while I was thinking in millimeters. The result was three boards from OSHpark that had the tiniest sliver of ground/VDD plane exposed around each pad. So the plan was to solder one board together to test it, and if it worked, start selling the project on Tindie. But of course I didn’t see the problem (stupid 50 year old eyes) and I couldn’t figure out why my VDD was shorted to Ground. So I shrugged it off and made the second board of the three, step by step so I could make sure the short wouldn’t happen again. But of course it did, very quickly. I eventually made that second board work because I carefully cleared all the solder shorts, but I had to put a big warning on the board with a Sharpie. But that didn’t happen before I soldered the third board together (aware of the problem) and still couldn’t make it work: to add insult (bad luck) to injury (stupidity) the third board was missing a lot of vias because the drill had apparently broken in the middle of production, and no-one had noticed. I designed a microcontroller board once. The power stabiliser was down left. The plus was going up and then to the middle where a flipflop clocked the data out. The minus went to the right and then up and then to the middle to the flipflop.I created a heck of a coil there. A capacitor was not needed i thought during designing. The flipflop created his own data, and didn’t clocked the data from the databus. That board was a kind of randomgenerator instead of a microcontrollerboard. I solved the problem with a capacitor and an extra wire for the minus. I improved my PCB-designing skills since then a lot. I solved the problem with a capacitor and an extra wire for the minus. I improved my PCB-designing skills since then a lot.